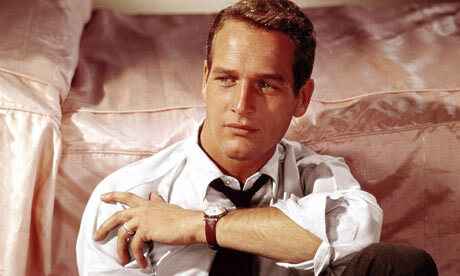 Looking at the career of Paul Newman, it is tempting to focus solely on those piercing blue eyes. There wasn’t a pair to match them in a business where eyes are the primary means of expression, and Newman’s continue to shine, years after his passing, with an illuminating brilliance. 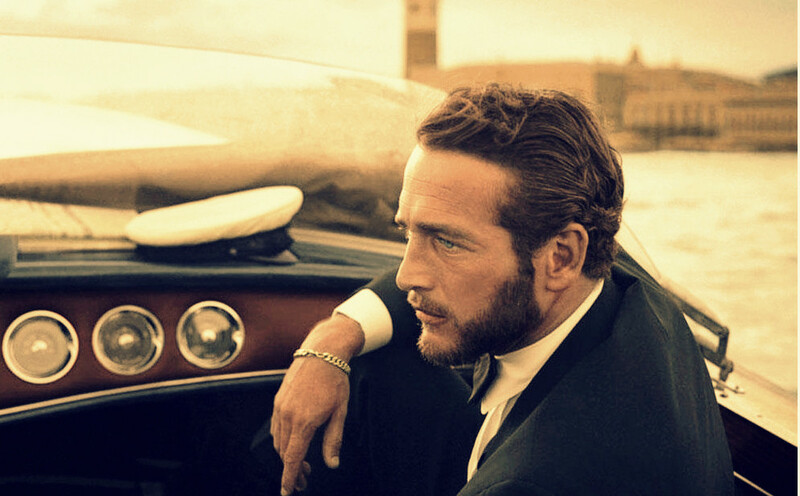 But of course, Newman’s iconic power lies in the fact that he never rested on his looks, instead using the intelligence behind those eyes to create a catalogue of classic film roles, a successful business empire, and a lasting philanthropic legacy. In fact, it could be said that he successfully broke out of the prison of his handsome face, to reveal the complex, yet fundamentally decent, person within. Born in an upscale neighborhood of Shaker Heights, Ohio, Newman found his gift for acting in childhood and pursued it right through his service as a WWII airman. Ironically, when it was discovered that those startlingly blue eyes were in fact color blind, Newman was benched for a time from combat, eventually becoming a radio operator. 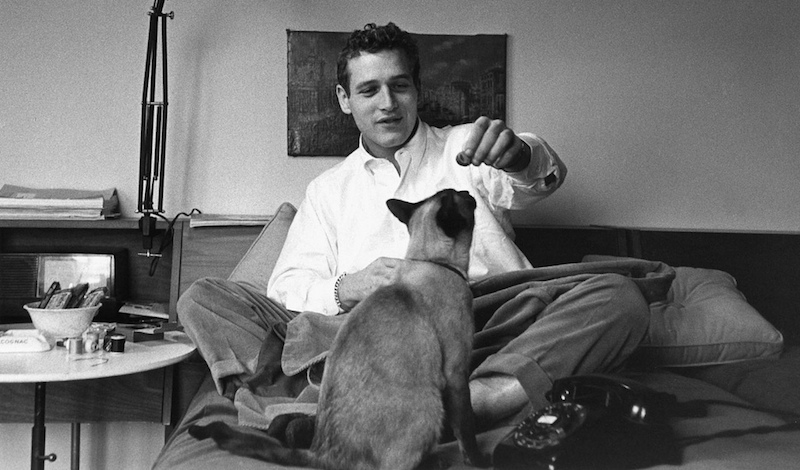 Five decades later, Newman would become so well known for his work outside of acting, primarily via his “Newman’s Own” line of foods, that some needed reminding that his path to fame began on small stages studying acting, first at the Yale School of Drama, and then with the father of method acting, Lee Strasberg, at the Actors Studio in New York. 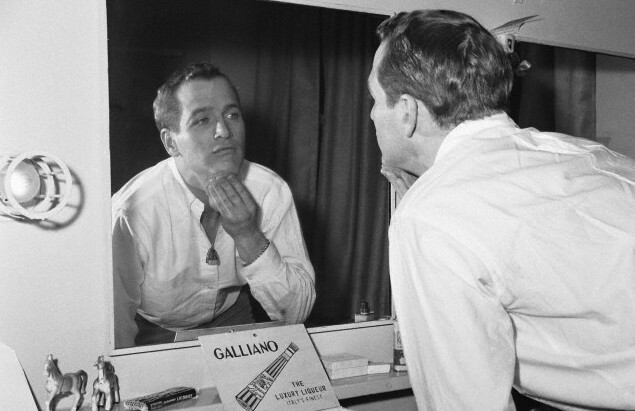 From those stages, where his classmates included Marlon Brando, James Dean, and Karl Malden, emerged an actor with his own brand of integrity, whose characters reflected his rebellious spirit, but also his sense of justice and fairness. 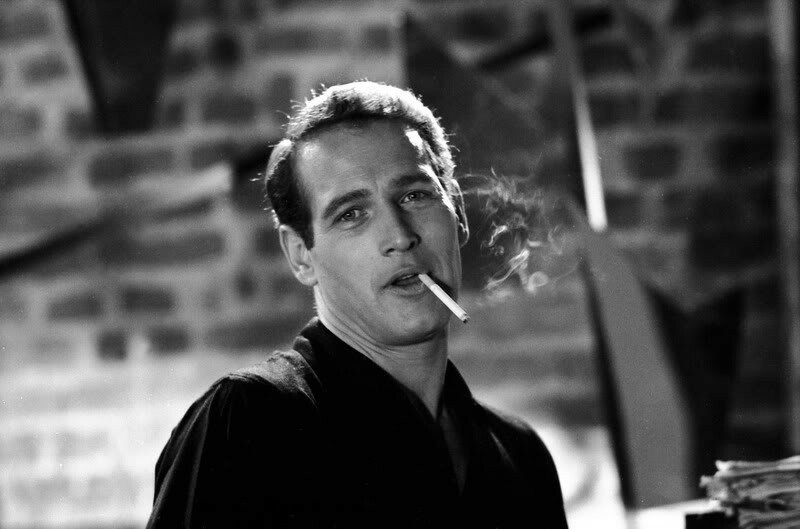 Strasberg once commented that Newman could have been as great an actor as Brando if he hadn’t been so handsome. But would his sense of humor have been as delightful and unexpected? In much the same way that George Clooney uses mischievous humor as a foil for his looks, Newman used his to cut against the grain of a masculine beauty so strong that it could have become a barrier between him and the audience. He would never allow that to happen. Throughout his long career, Newman stretched his range, but always returned to the wry, funny, relaxed persona that defined his public persona. 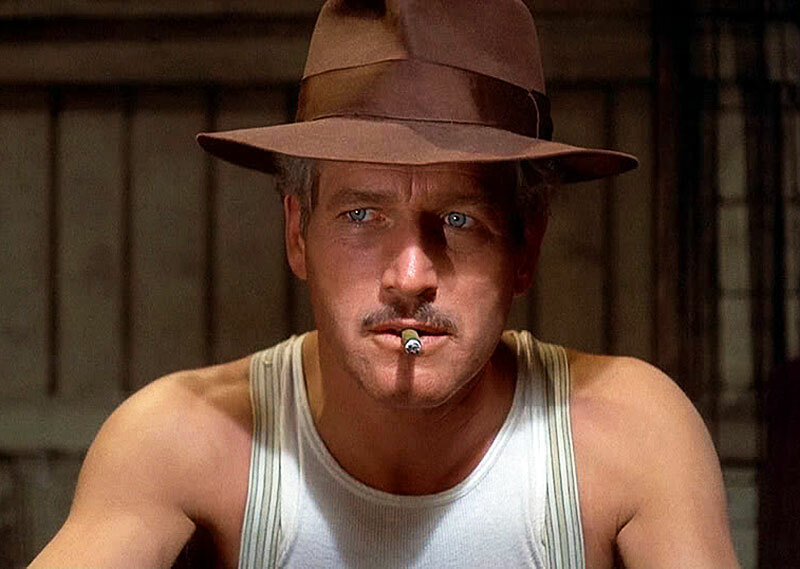 I’d suggest his unique brand of charm was best showcased in two particular films: “Butch Cassidy and the Sundance Kid” (1969), and “The Sting,” (1973). 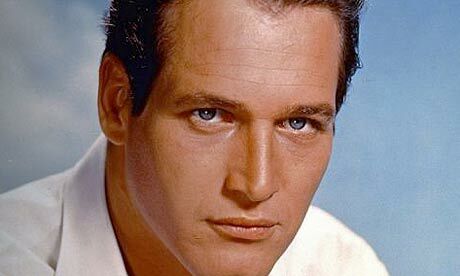 The humor shows up in his eyes, and while blue eyes are often called “steely,” Newman’s were perennially friendly, with a glint of the bad boy sparkling in the corner. He knew exactly what he was doing, always, and could not help but bring a bit of the imp to any role that wasn’t intentionally downbeat. For example, when the first cut of “Butch Cassidy” was completed, it was deemed “too funny” and had to be re-cut. Most filmmakers would relish having that as a problem! 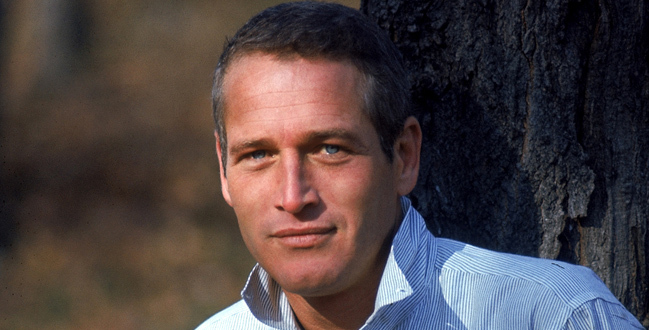 Naturally, Newman knew just how potent his eyes were, saying once that he could envision his epitaph: “Here lies Paul Newman, who died a failure because his eyes turned brown." That is the ultimate joke. The eyes are the window to the soul, and while this pair may have been more clear, more blue, more bright than any other on film, ultimately it’s the way they speak to us, and the understanding and sympathy they convey, that make them (and him) so beautiful. 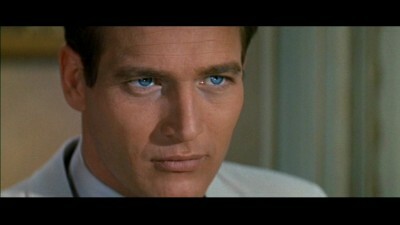 If looks could thrill: these eyes are the real Newman’s Own. Smoke gets in your eyes, but they are no less blue. Among young Paul’s superpowers, making cats do his bidding. It really was love at first sight. 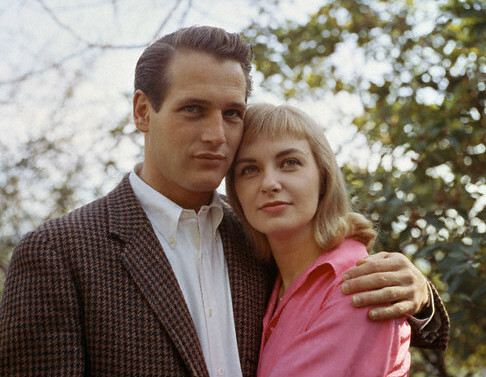 Newman and future wife, Joanne Woodward. Newman’s blues saw his future and he went for it. Holding up a wall never looked so good. Novel idea: Newman and Woodward looking literary for the production of “From the Terrace” (1960). 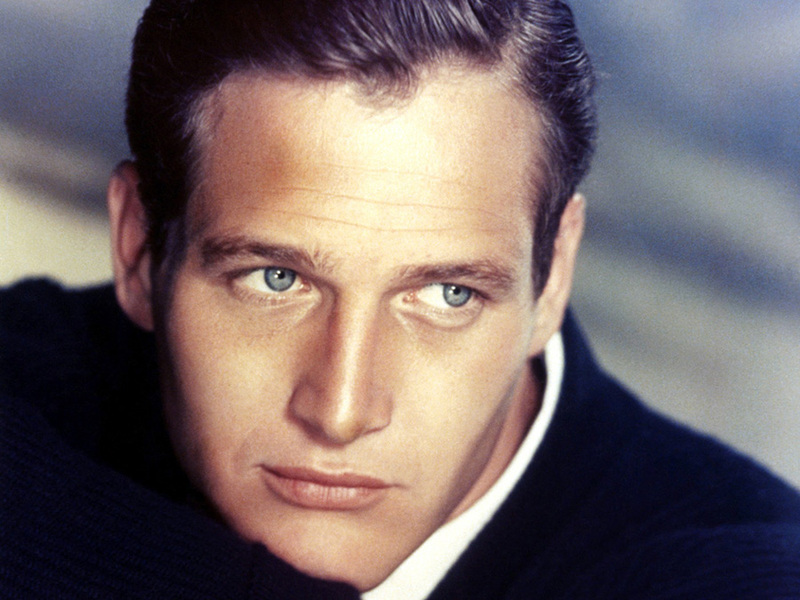 Taking it on the chin: Newman’s eyes were not his only strong feature. His chin could chisel marble. 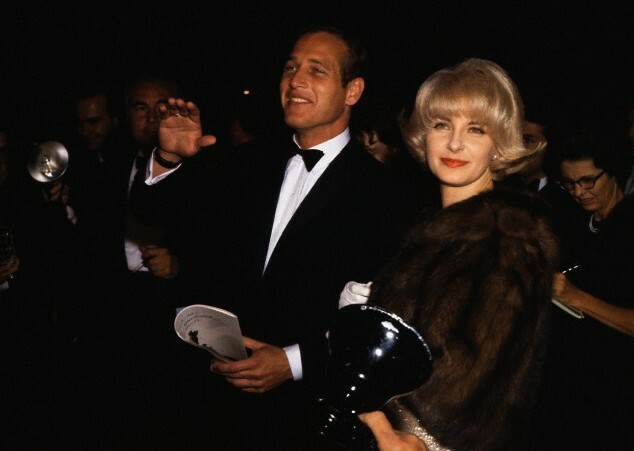 Premiere service: Woodward and Newman in the glare of flashbulbs for an opening. Making a good impression: sticking their hands in wet cement at Grauman’s Chinese Theater, 1963. She’s the yin to his yang. A kiss between two halves of a whole, 1963. Blue on blue, 1964. The Greeks would be jealous: The Aegean isn’t even this blue. 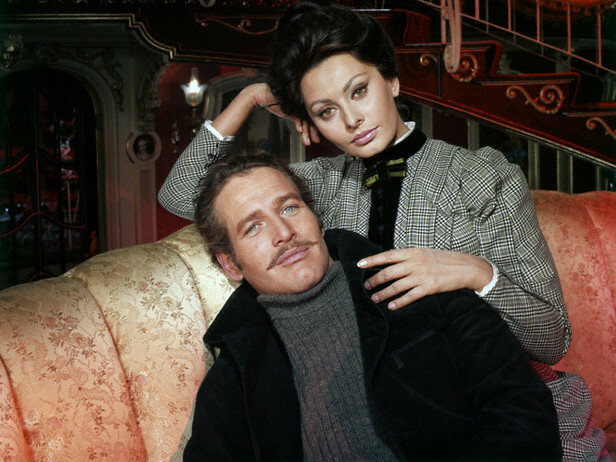 With Sophia Loren in 1965. In a …’stache? 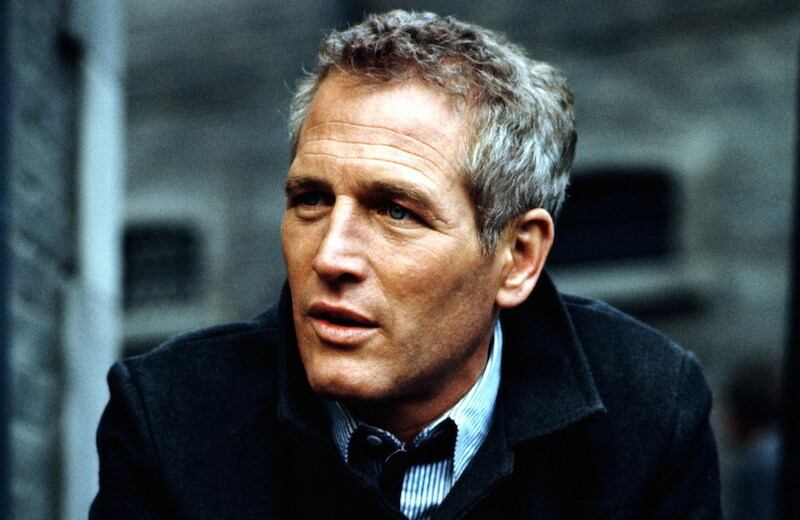 Hey, when you’re Paul Newman, not even questionable facial hair lowers the handsomeness quotient. 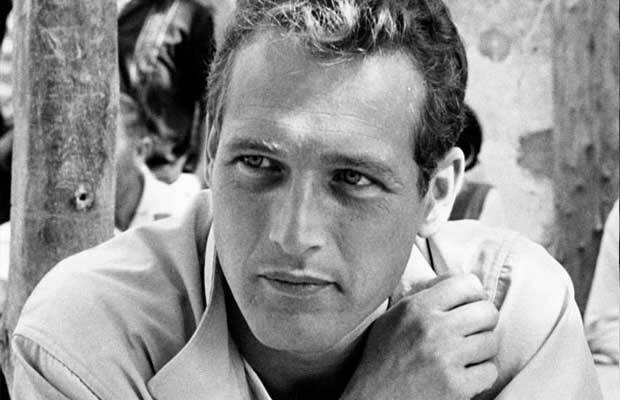 In this black and white shot it's possible to notice Newman’s other features, such as perfect eyebrows. I mean, who has perfect eyes and perfect eyebrows? 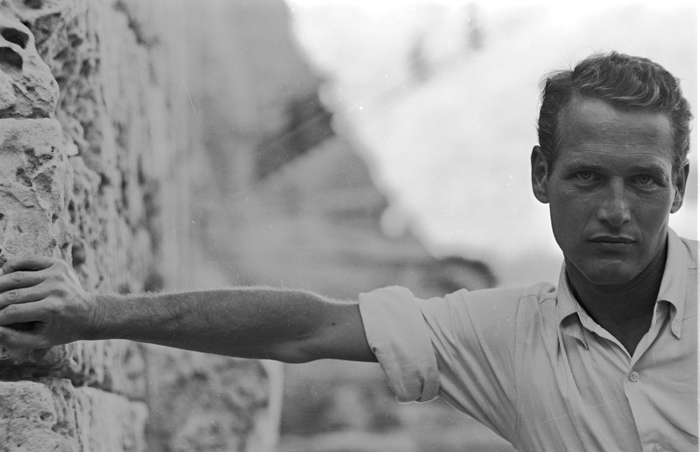 Paul Newman, that's who. 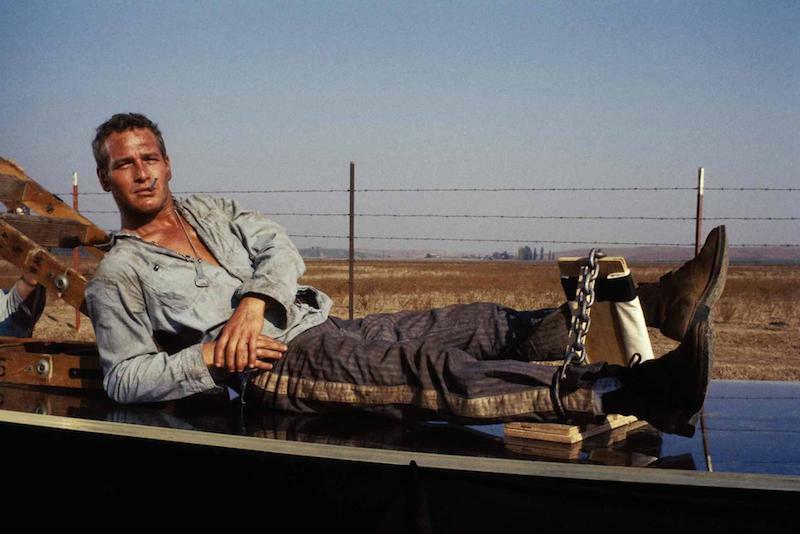 “Cool Hand Luke” (1967). No more eggs, thanks. I’m good. 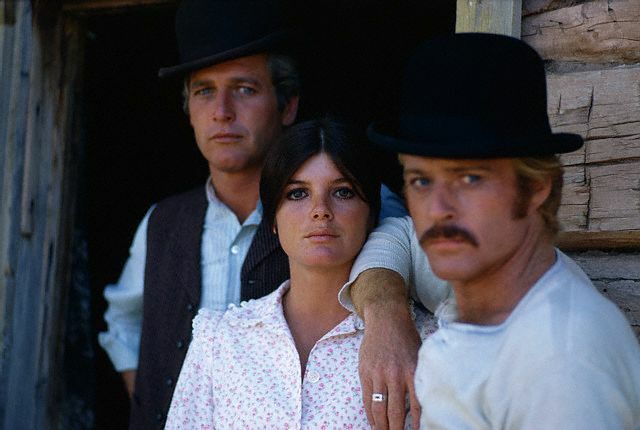 With Robert Redford and Katharine Ross in “Butch Cassidy and the Sundance Kid” in 1969. 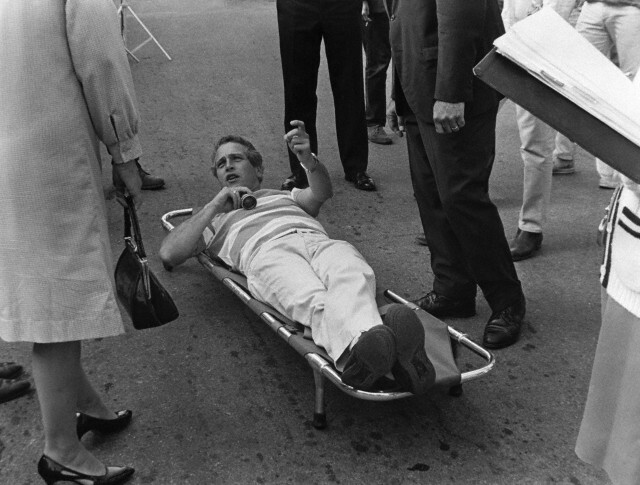 Newman performed his own stunts on a bicycle when the stuntman was unable to do it. The Silva Mind Control Method has nothing on the magnetic power of this penetrating gaze. Ignoring his watch, perhaps while contemplating eternity- or something more earthbound. Skinny ties, low-cut dresses, cold martinis. Those were the days. 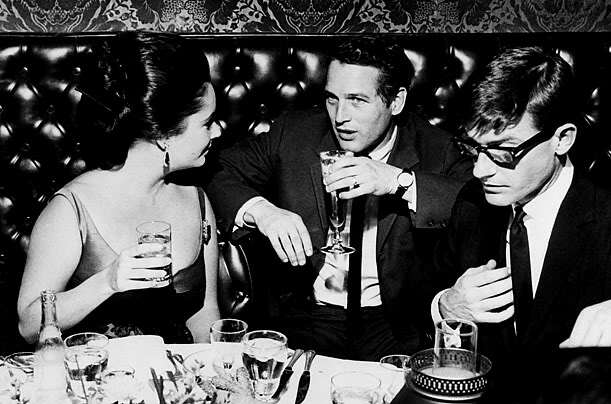 With Liz Taylor and Roddy McDowall. 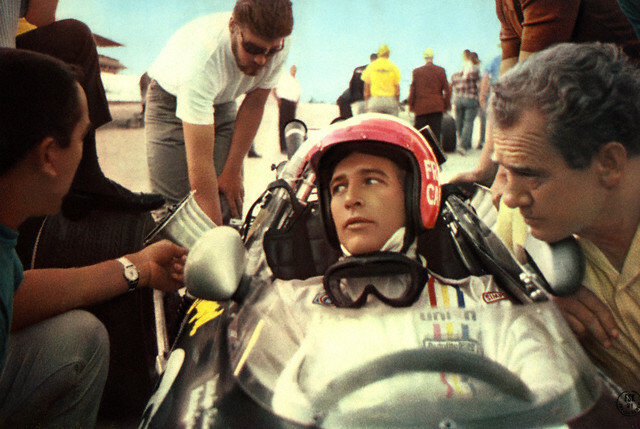 One thing you could always say about Paul Newman, he wasn’t buttoned down. Ah, this is more like it. 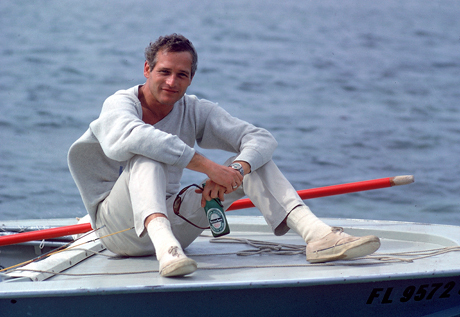 Deck shoes and a Heineken. “The Sting” (1973). He damn near brought back the undershirt in this role. Gray hair only accentuated the blue of his eyes. His eyes never aged, and therefore, neither did he.